You came here seeking Freedom. You must now help preserve it. Wheat is needed by the allies. Though this poster focuses on the conservation of wheat, other food categories such as corn, barley, meat, and vegetables were no less important. In order to effectively reach immigrant populations, the poster was also produced in such languages as Yiddish, Italian, Spanish, and Hungarian. 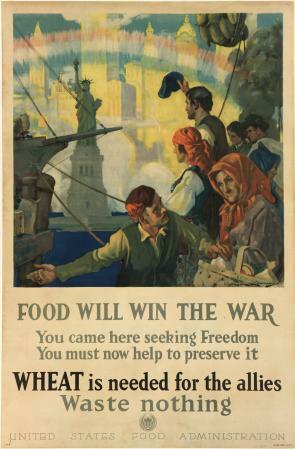 Using the incentives of price and patriotism, the United States was successful in its mission to feed the Allies. Why did the United States Food Administration print and distribute this poster? Explain an emotional reaction the artist hoped would convince the viewer to voluntarily conserve food. Why was the poster produced in multiple languages? Why did the artist include in the picture the Statue of Liberty, the skyline of New York City, and the rainbow?